The Marquise cut diamond commonly perceived as a football shaped diamond also goes by many other names, including the eye cut, or even sometime referred to as the navette cut due to its unique shape. This stretched out gemstone, though not the most popular cut of the lot, has pointed graceful ends that give it a dramatic look. It is a perfect cut for those creative brides who want a dramatic diamond engagement ring. As these diamonds are long and narrow with a wider spread that creates an illusion of larger size. 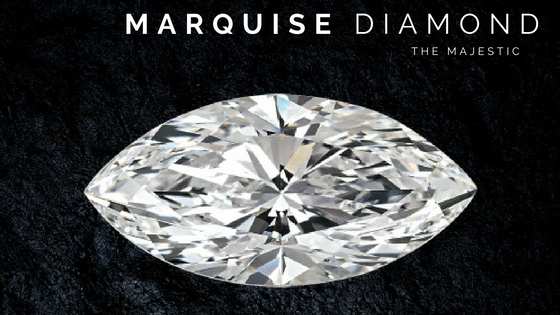 Marquise diamond has one of the widest crown surface areas compared to any other diamond shape with brilliant 58 facets. If you want a diamond that look bigger, marquise would be your best bet. However the wide open table of marquise shape might show off the inclusion quite clearly. The marquise cut is a classic diamond cut with rich history that dates back to the Victorian Era. The marquise is a variant that combines round and pear shaped diamonds. It perfectly complements long slender fingers making the fingers dawning on the diamond engagement ring look elegant and graceful. Suggested Cut Ratio: 1.75 to 2.25 is the ideal shape. The marquise cut diamond also nicknamed football-shaped is known for its dramatic shape and timeless appeal. This majestic cut like its name suggests has a very intriguing origins. As the legend goes, during the 18th century France, King Luis XV commission his jeweller to craft a diamond that resembled the lips of Marquise de Pompadour who was his beloved. The cut that originated was named after the inspiration, Marquise. Also known as the as a Navette cut, this stretched out stone looks like an eye shape which gives it a dramatic look. Because of the fact that Marquise Cut was crafted to look alike lips, it has a wider spread and tapered corners that create an illusion of visually larger size. Marquise cut diamond has one of the widest crown surface areas compared to any other diamond shape with brilliant 58 facets, making it an ideal choice when trying to capitalize on larger size with brilliance without putting a hole in your wallet. POPULARITY: The marquise cut diamond exudes drama with its brilliant cut and iconic shape. Because of its fascinating history and distinctive shape marquise diamond engagement rings, marquise shaped diamonds though not as popular as the round and princess cut still swanks a mass following. It’s hardly a surprise that celebrities like Catherine Zeta Jones, Victoria Becham and Portial De Rossi are seen wearing a marquise shaped diamond engagement ring. Most iconic of all is 100 carat diamond ring worn by Queen Latifa that take the centre stage. Rings set with marquise cut diamonds make the fingers of the wearer look more slender because of it wide spread. With an excellent cut it not only maximises the fire but also the carat weight giving the facade of a larger diamond than a round diamond of the same carat weight, making it quite popular with budget conscious people. A marquise cut diamond has a arresting appeal on its own but looks astonishing when paired with other accent stone to form an exquisite side stone ring. Because of its unique shape a marquise shaped diamond goes well with a number of setting. But a marquise diamond set in prong setting with a V prong the excellently covers the tapered edges (the most likely spots for chipping). It is obvious to find more inclusion and flaws near the tapered edges of the diamond are the points closest to rough diamond. However these inclusions get easily covered in the prongs and its brilliance tend to mask the other inclusions found near the centre. Another setting that goes well off is a halo setting. It not only makes the diamond look bigger but adds a vintage classiness to the entire diamond engagement ring. The versatile shape of marquise allows a lot of ration. However, the ideal length to width ratio of 1.75 to 2.15 is recommended for this type of cut. The marquise shaped diamonds’ distinctive cut with elongated body and pointed edges like other fancy cuts allow to preserve a lot of rough diamond weight with less wastage. This drastically reduces the price per carat weight of the Marquise cut diamonds. However marquise cut need an elongated diamond to cut in this particular shape as compared to the round cut diamonds of similar carat weight. Marquise cut diamonds are more economically priced than other fancy cut diamond. Also because they tend to look bigger visually with equally amount of fire and brilliance, this is best choice for those who are looking for a bigger looking diamond within budget. The price of this diamond also depends upon the carat weight and colour grades. For larger carat weigh or/ and higher colour grade (above H) the buyers are prepared to, pay a substantial prize to get them. Before buying it is recommended to look at the ideal table, depth and length to width ratio combinations for marquise cuts.